In March of 2018, a cluster of reports from Maui residents and visitors of white-rumped shamas in West Maui came in on the online birding database, eBird. 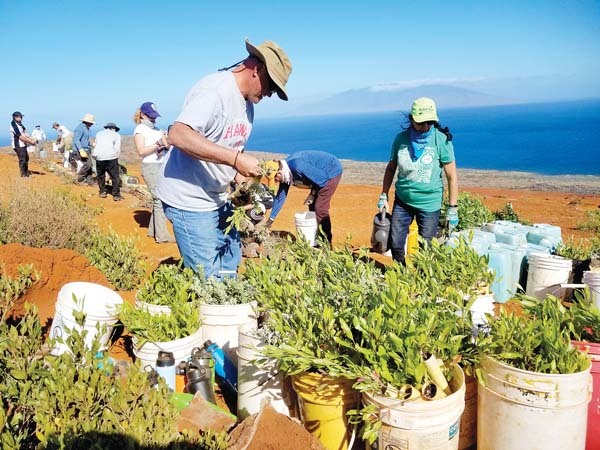 The Maui Invasive Species Committee and other organizations had received reports before, but the frequency of reports caught the attention of Chris Warren, who works with the Maui Forest Bird Recovery Project. These birds weren’t known to be widespread on Maui. White-rumped shamas are not native to Hawaii. These introduced species have established breeding populations on Oahu, Molokai, Lanai and Kauai, but only scattered sightings had been reported on Maui in the past. No new invasive species is a welcome addition to our fragile ecosystems here on Maui. Warren and his team went to Kapalua and the Honolua area to investigate. “Pretty soon it was evident that there were more than just a few birds out there, “ says Warren. This wasn’t a case of a lone bird — the team found shamas in streambeds and forested areas from Napili to Honolua Bay, but the full extent of their population is still unknown. White-rumped shamas are native to western Indonesia, southern India and southwestern China, but have been introduced elsewhere as a result of their popularity as cage birds and songsters. Here, their diet consists mainly of small insects that they pounce on while in the underbrush. According to Warren, there are other introduced birds that may pose a greater threat to native birds than the shama, but what has resource managers concerned is that a bird new to the island went unreported for so long. “Our native birds are already at a tipping point, the last thing they need is another competitor,” he says. White-rumped shamas are part of the host of bird species brought to Hawaii during an era of bringing in songbirds. By the turn of the 20th century, avian malaria and introduced predators had already brought native Hawaiian bird populations to low levels. Residential gardens were quiet but for the squawking of mynas and calling of doves. The socialites of Honolulu formed garden clubs for the purpose of importing songbirds — which only put added pressure on native ecosystems. From the 1920s up until the 1960s, when the practice was restricted, these garden clubs introduced many species of songbirds. 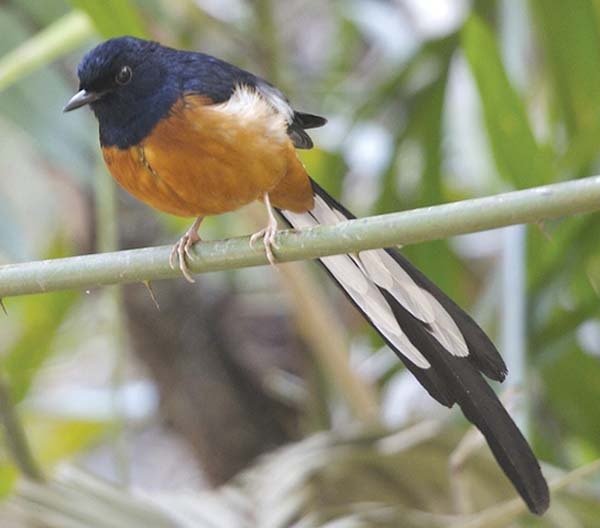 Not all of these birds became established, but many did, and the musical white-rumped shama was among them. Shamas were first released on Kauai in 1931 and then on Oahu between 1938 and 1940. Those 89 birds then spread, reaching Molokai in 1997 and Lanai by 2009. They may have crossed between the islands on their own, but it’s also possible that humans helped them spread interisland. Warren and his colleagues are not exactly sure how far the shamas have spread on Maui. With the help of other resource management organizations, Maui Forest Bird Recovery Project is working to determine the distribution of these singing flycatchers. You can help! • White-rumped shamas are 9 to 11 inches long, about the size of a northern cardinal. • They have long tail feathers and spend much of their time in the underbrush. • Males have a glossy bluish-black back and head, a chestnut brown belly and white patch feathers under their tail. Females have a tan head and back with chestnut belly. • Their song is impressive, both in range and volume, making them hard to miss. • Find information with photos and recordings online at birdsna.org/Species-Account/bna/species/whrsha/introductionReport sightings, with a photo or recording through the online pest reporting system, 643PEST.org. While the white-rumped shama is likely here to stay, there are exotic bird species present on other islands that have not yet reached Maui. 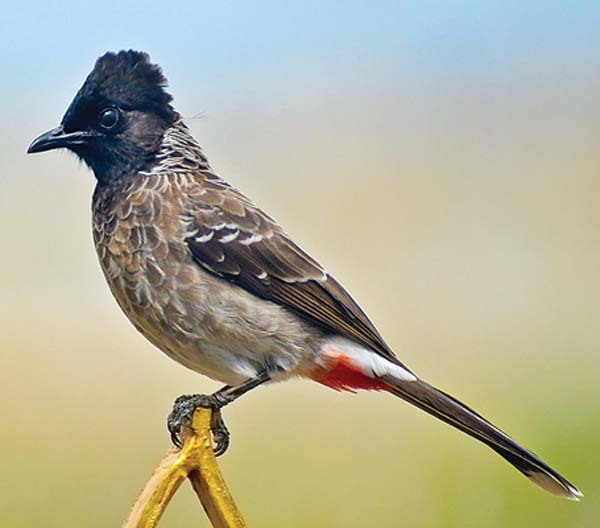 Red-vented bulbuls found on Oahu are one example. They are voracious fruit eaters and serious agricultural pests that quickly dominate the landscape. To keep a new invasive species from becoming established, finding it early is essential. If you see something new in your yard, birds notwithstanding, take a few minutes to report it on the statewide pest reporting system, 643-P. Either call 643-PEST(7378) or use the online report form, 643PEST.org.